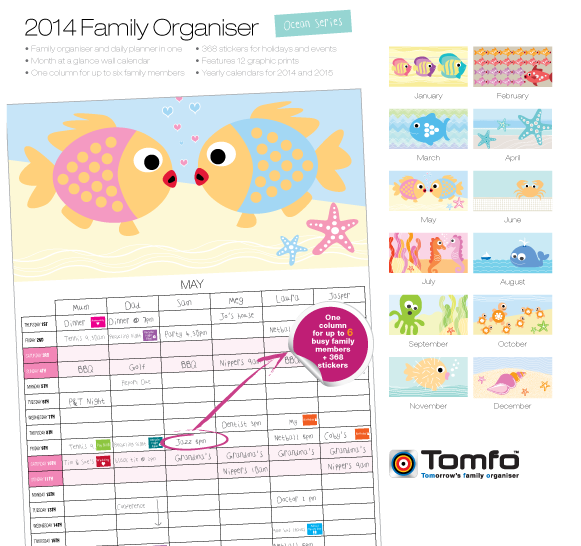 With space to keep track of up to 6 family members, 2014 TOMFO is the perfect month-at-a-glance family planner for busy mums! This 6 column grid format is a perfect way to organise your busy family, with spaces to write up to 6 family members appointments and events, you’ll be super organised so you can enjoy all the things you love. The 2014 family organiser calendar comes with 368 stickers to mark special events like birthdays, holidays, recycle nights to name a few. Here is our review from Family Deal Friday, check out what they thought…. The Family Organisers arrived in a large envelope with cardboard to ensure it did not bend. It also included a small business slip of paper and a thank you comment personally addressed. This product is self explantory and therefore no instructions are needed however examples of how the organiser can be used is displayed on the cover. The Tomfo is suitable for the entire family to use to organise their daily lives. The pages of the Tomfo are made of thick, high quality paper so that it is sturdy and hangs well on a hook on the wall without worrying about it tearing. It is easy to write on each page with both pens and pencils. Valued at $25 each I believe they are great value for money considering the size and space available. It is more than a calendar. It is a daily planner that you can hang neatly on your wall to organise your life. I would definitely recommend this product to others as I have found it has made life so much easier as I can now view at a quick glance what everyone is doing in a day. It is an excellent reminder of important dates and appointments. Individual columns for family members allow recording of everyone’s daily activities. The month by month layout is also handy in planning ahead. Tomfo are very helpful and friendly, always ready to answer any questions you may have. They also provide fast shipping that ensures you receive your organisers within a matter of days. The organiser has been used to record birthdays, appointments, playdates and daily activities for each member of our family. It has allowed us to become better organised by being able to glance at it the night before and know what is happening the next day. No more missed appointments or birthdays in our house now. The stickers provided also help to visually display what is happening and bring more colour to the organiser. These stickers also make it fun for younger children to use the organiser allowing them to become involved. No more bulky diary sitting on our kitchen bench and no need to flick through pages, it is all available month by month on the wall. I look forward to using next years organiser. Thank you Tomfo. It’s nice to hear someone else’s opinion on TOMFO…. thanks for the review, check out our friends over at Family Deal Friday, they have great shopping deals over there. Superhero instant download reward charts, that you can personalise with your child’s name and milestones to achieve, download and print out as many times as you require, change the tasks as you grow, available in Superhero, Fairy, Mermaid and Dinosaur, too cute! Stay tuned, I will soon have even more designs in the shop so check back often, and of course I will be adding FREE printables for my subscribers in the coming months. So… if you’d like to be on the list to see what I’ve been up to, subscribe to my posts so you don’t miss selected downloads for FREE. At the moment you can download Santa’s Beard Christmas Countdown calendar for FREE here.